Setting The Standard In Family Law “The true measure of a firm’s quality and capability is its commitment to client service,” says Edward D. Barnes. The firm’s commitment and personal attention have made Barnes & Diehl, P.C. the largest law firm in the state devoted to family law. Its high levels of client satisfaction result in subsequent referrals. EDWARD D. BARNES Named 2009’s Richmond Family Lawyer of the Year in The Best Lawyers in America, voted to the Top 50 list in 2010 in Virginia Super Lawyers®, recipient of the 2008 Lifetime Achievement Award from the Virginia State Bar’s (VSB) Family Law Section and the University of Richmond School of Law’s 2006 Distinguished Alumni Award. He is chairman of the National Center for Family Law and a certified Fellow of the American Academy of Matrimonial Lawyers. He teaches Legal Ethics at University of Richmond School of Law. LAWRENCE D. DIEHL Every family law practitioner in Virginia knows Diehl’s name. He co-authored Virginia Family Law: Theory Practice and Forms, was named 2010’s Richmond Family Lawyer of the Year in The Best Lawyers in America and is a recipient of the VSB’s Lifetime Achievement Award. Additionally, The Virginia Law Foundation’s joint CLE committee presented him with the Gardener G. DeMallie Jr. Award. He was named one of the Top 50 lawyers for 2009 in Virginia Super Lawyers. He is a certified Fellow of the American Academy of Matrimonial Lawyers. BRIAN H. JONES Past chair of the family law section of the Virginia Trial Lawyers Association (VTLA), Jones is a former member of the VTLA’s board of governors and chair of the publications committee, and a certified Fellow of the American Academy of Matrimonial Lawyers. He is the author of Domestic Relations for the Virginia General Practitioner. MICHAEL HUYOUNG Mr. HuYoung has been selected as a Fellow in the Virginia Law Foundation, recognized as a Best Lawyer in America, A Virginia Super Lawyer, and a Virginia Legal Elite. He has co-chaired the Virginia Criminal Justive Conference, served on the Board of Governors for the Virginia Trial Lawyers Association of Virginia, and charied its Criminal law Section. He serves on the Faculty of the Virginia State Bar’s Professionalism Course, has been selected to the Virginia State Bar’s Diversity Conference Board of Governors and is it’s Chair-Elect. He serves on Bar Council for the Virginia State Bar and serves on the Citizen Committee for Voting Rights in the County of Henrico, Virginia. STARS ON THE RISE In addition to upholding an established reputation for excellence, Barnes & Diehl, P.C. attracts the finest young lawyers who share its dedication to client service. The firm congratulates its six attorneys on the 2010 Virginia Rising Stars list, which is comprised of the state’s top up-and-coming attorneys: David G. DeFazio, Rick A. Friedman II, John K. Karanian, Vanessa L. Jones, Brandy M. Poss and Irene C. Delcamp. Rothesay will be transformed by 37 design firms. Tuesday, Oct. 12, preview at 6 p.m., auction at 7 p.m. Live and silent auctions of the furnishings, art and accessories used in the designers’ rooms and gardens at Rothesay on the James. A catalog of the pieces to be auctioned will be available at the home and online at rsol.com. Call Beth Greene at 608-0101 for additional information. * BOOKS WILL BE AVAILABLE FOR PURCHASE IN THE BOUTIQUE. BOOKS THAT HAVE BEEN PURCHASED ELSEWHERE MAY NOT BE BROUGHT IN FOR AUTOGRAPHING. ensures that the greater Richmond area will continue to enjoy beautiful symphonic music for generations. We are so glad you came! When the Quality Shows it Must be Franco’s. Thanks to our customers, whose loyality for 38 years has made us the best menswear store in Richmond. Franco’s is a family owned business. Shown in photo: Franco Ambrogi (center). son, Mark Ambrogi (right), son-in-law, Kevin Reardon (left). Hickey Freeman — September 10-11 Robert Talbott — September 23-24 Measure Up Custom Shirts — September 24-25 Hart Schaffner Marx — October 27-28 Company representatives will be present during these events to offer their expertise with styling, fit & fabrics. Please note: Children under age 8 (including infants) will not be permitted in the house. Photographic equipment is prohibited. For your safety and comfort, low heels or flat shoes are required. Due to the nature of the house, we are unable to make it fully accessible for people with disabilities. house closes for the day. Sept. 13 – Oct. 11, 2010 Monday - Friday 11 a.m. – 2 p.m. Saturdays 11 a.m. – 3:30 p.m. Sunday Noon – 3:30 p.m. Enjoy a delightful choice of sandwiches, salads and soup along with a glass of wine or beer while dining in a beautifully designed space compliments of Accent Draperys. Catering by Cateraide. eorge Anderson’s earliest memory of his childhood home, Rothesay, is of cutting the field on the south end of the house — a small portion of the sprawling 8-acre estate — with a push mower, along with his father, Edward Clifford Anderson. Anderson and his parents moved into the grand English Tudor estate at 1234 Rothesay Circle in 1934, when he was 7 years old. On Aug. 1, he and his wife, Anne, moved a lifetime of accumulated belongings out to make way for more than 30 interior designers and landscape architects to work their magic and transform the house into the Richmond Symphony Orchestra League 2010 Designer House. Rothesay was originally built by Jonathan Bryan, brother of newspaper publisher John Stewart Bryan, in 1913. The house is named for the Bryans’ grandfather’s hometown, Rothesay, in Isle of Bute, Scotland. Joseph Bryan (1845-1908) and Isobel Lamont Stewart (1847-1910) marry in 1871 and have five sons, including newspaper publisher John Stewart Bryan (1871-1944) and Jonathan Bryan (1874-1933). Jonathan Bryan marries Winifred Duffy Hayden (1888-1964) in 1911, but they have no children. Rothesay is built for Jonathan Bryan and his wife. Top Left: An early photo of Rothesay (circa 1914) shows a large tower that has since been removed from the front of the house. Center: Rothesay backs up to Gillette gardens and the river. John Stewart Bryan sells Rothesay to Edward Clifford Anderson and his wife, Isabel Walker Scott Anderson. The Andersons had three children, including present-day owner George Anderson. Edward Clifford Anderson dies in 1985, and Isabel Walker Scott Anderson dies in 1994. Except for a stint serving in the military during World War II, George Anderson has lived at Rothesay for most of his life. He and his wife, Anne, reside at Rothesay now. Let The Hermitage help you with short-term care for your loved one. When you need a break from your care-giving responsibilities, choose Respite Care at The Hermitage. We offer: Independent Living •	Independent	Living	Assisted Living •	Assisted	Living	Nursing Care •	Nursing	Care	Memory Care in a •	Memory	Care	in	a	secured	setting	secured setting Speech	Therapy,	Speech Therapy, •	Physical	Therapy,	&	Physical Therapy, & Occupational	Therapy Occupational Therapy Find out more — call 1-804-474-1800 today. 1600 Westwood Avenue Richmond, VA 23227 www.hermitage-vumh.com Our Mission: The	mission	of	Virginia	United	Methodist	Homes,	Inc.	is	to	provide	facilities,	services	and	programs	to	enhance	the	quality	of	life	for	older	persons. the Virginia Historical Society were found that could confirm Duncan Lee built or designed Rothesay. Based on stories handed down about the house to him, George Anderson also believes Mrs. Bryan had a hand in its design. “Mrs. Bryan insisted that every room have a river view,” he says. McCrea adds, “She may have done some drawings or specified the size of the rooms, but there are no records of any architectural plans.” According to Virginia Architects 18351955: A Biographical Dictionary, by John E. Wells and Robert E. Dalton, “After Lee’s death in 1952, most of his office records were burned, at the architect’s request.” An early photo of Rothesay (see pages D10 and D11) shows that the house initially featured a large tower on the front, but it has since been removed. Following Jonathan Bryan’s death* in 1933, his brother, John Stewart Bryan, sold the house a year later to Edward Clifford Anderson and his wife, Isabel Walker Scott Anderson. “Isabel was an accomplished pianist, according to her obituary [in the Richmond Times-Dispatch, Nov. 28, 1994],” McCrea says. “And the obit also says she was a founder and patron of the Richmond Symphony, so it is very appropriate that her son and his wife are making this magnanimous gesture for this cause.” George Anderson, Isabel’s son, remembers many a musical performance held in his childhood home, and rumor has it that Ella Fitzgerald may have even performed there once. “My mother passed on her musical talent to all three of her children,” Anderson says. “My sisters played by ear, but I play by memorizing,” he says. Randy Trainor, Anderson’s daughter and the interior designer for the Rothesay library, also remembers the music more than anything else. “I don’t remember if Ella Fitzgerald ever played at my grandmother’s house, but I do remember chairs being lined up for performances in the living room and going all the way back into the hall,” she says. View Our Work Online at chesapeakedesigns.net. Illustrations adapted from floor plans drawn by architect John VanDersyde (804) 683-9181. Editor’s Note: The sketches, photos and room descriptions on the following pages are conceptual. Some fabrics, wall treatments and furnishings may not be depicted or described. Please contact the designers about items in their spaces. through music and art.” A Regency duet music stand from England along with musical instruments are highlights of the 16-by-14-foot space, but so are the carefully selected antiques and modern art, which underscore the big impact of this black-and-white marbled space. Tosca Roberts was educated in Germany and has lived in seven different U.S. states. Because of this, she tends to attract clients who also move frequently within the United States or abroad. She has designed homes in Colorado, California and Texas and all over the East Coast. Design projects range from contemporary to country French and from traditional to Asian themes. Items pictured may not appear in final rooms. Contact designer for details. Selected by Traditional Home magazine as one of the Top 20 Young Designers in America for 2009, Tobi Fairley has a signature style that combines colorful, large-scale prints with classic furniture. Since establishing her firm more than a decade ago, Fairley’s award-winning designs for high-profile clients have been featured on HGTV and published on the cover of House Beautiful. SAVE NOW ON EVERYTHING FOR YOUR HOME. RICHMOND 12000 WEST BROAD STREET JUST WEST OF SHORT PUMP TOWN CENTER 804.360.1530 Introducing the Parker Chair $1459. See Design Center for details. ©2010 Ethan Allen Global, Inc.
ed black and accented with Eglomise mirror and silver-leafed accents.” The room’s color palette is a soft metallic. The abstract floral design on the walls is silver, antique gold and pearl, and artwork by Chris Lombard adds bold coral accents. Jennifer Stoner received her bachelor’s degree from the University of Florida and started Right at Home Consign and Design in 2000. She established Mosaic Interiors in 2005 and later sold Right at Home. She has just launched her new brand, Jennifer Stoner Interiors. Stoner participated in the last three Symphony Designer Houses. She was president of the Richmond Chapter of the International Furnishings and Design Association in 2008.
installation of custom cabinets* * Restrictions apply. Call for information. Prestige Custom Cabinetry strikes the right balance between custom quality and price. It’s great to get exactly the cabinets you want for the right price! Distinctive design options to create a kitchen so personal, it could only belong to you. At PRESTIGE CUSTOM CABINETS AND COUNTERTOPS, our professional team is focused on personalized service and ongoing expertise in the cabinetry craft, enabling us to realize the unique vision of each client. Exceeding the expectations of our customers is our top priority. Attractive, Functional, Practical. We install to enhance your kitchen! Leslie T. Stephens, CID, business founder and interior designer, has more than eight years of commercial, residential and architectural design experience.With a passion for drawing, sculpture and fine arts, Stephens began as an artist. Her leadership and organizational skills have helped her guide clients through the design process for simple, yet expressive results. Leslie earned a bachelor’s degree in interior design from Virginia Commonwealth University. Picture what our designers can do for your yard. the best return on investment for your landscape dollar. We invite you to call us for a free consultation: (804) 798-2020.
the recycling umbrella so everyone’s doing it. Founded 26 years ago by John George, John K. George & Co. has a reputation for excellence in high-end residential remodeling design and construction. George has a bachelor’s degree in history from Mary Washington College with an emphasis on historic preservation and computer science. He apprenticed with Preservation and Restoration, a widely recognized construction firm led by Dr. Ronald E. Shibley. Let us ORCHESTRATE your dream. For the perfect products for your kitchen or bath, stop by a Ferguson showroom. It’s where you’ll ﬁnd the largest range of quality brands, a symphony of ideas, and trained consultants to help orchestrate your dream. With showrooms from coast to coast, come see why Ferguson is recommended by professional contractors and designers everywhere. ©2010 Ferguson Enterprises, Inc. All Rights Reserved. A living wall of plants, a custom-built table, a turn-of-the-century area rug, light fixtures designed by a small designer out of Brooklyn and a window seat round out the room’s healthy, eco-friendly feel. Kelly Brown began professionally practicing interior design in California in 2002 and relocated to Richmond in 2008. After garnering several awards for interior-design merchandising, Brown landed a position with a prominent residential designer in West Hollywood, Calif., D. Crosby Ross. continue the effervescent atmosphere of the room. Holly Chasan of Maison James Interior Design brings a unique combination of design inspiration, arts education and business acumen to her design studio. With nearly 15 years’ experience, Chasan is a graduate of the interior-design program at Virginia Commonwealth University. Chasan’s ability to connect with each client’s vision — and turn that vision into a reality — is her hallmark. Theresa Pollak-inspired ballerina paintings to continue the theme.” Jenny Andrews of Andrews Designs has worked on design projects in Richmond and nationally for the past 17 years. She started her own company in 1997, specializing in resort and residential design, construction and interiors. Andrews has had her projects published in local and national publications, including R•Home, the Washington Post, and Home & Design magazine and soon will be featured in Southern Living. and-silk carpet leads to the stairs. Karen Farrow began her interior-design career in 1977. Her projects include restaurants, offices, yachts, hotels and private residences. Jonathan Williams has been a designer for seven years. He participated in the 2008 Richmond Symphony Designer House and is president-elect of the Richmond Chapter of the International Furnishings and Design Association. The Wallpaper Place features 15,000 square feet of furnishings, lighting, art, carpet, fabrics and more. Fourteen years ago, Phoebe and Jim Howard opened the doors to their first store, Mrs. Howard, in Jacksonville, Fla., hoping to demystify the decorating process for their customers. Five years later, they added another store, Max & Company, which features a younger, more modern appeal. Now Mrs. Howard and Max & Company stores can be found in Jacksonville and Jacksonville Beach, Fla.; Charlotte, N.C.; and Atlanta, Ga.
W paintings (clockwise from top left) 1) Dandoy. 1885-1977. 19th-century French. Landscape with cows. Oil on canvas. 2) Christine Lafuente. Lamp, Egg Carton & Jar of Oil. Oil on canvas. 3) Signed and dated L.G. ’79. 19thcentury French. A Barbizon Landscape. Oil on canvas. châteaux and English country homes that were built with long gallery corridors and loggias for displaying ancestral portraits, genre scenes and landscapes acquired during travel. Frequently, their hand-carved gilded frames were works of art in themselves. For this space, she has carefully selected works by French and American artists from her gallery as well as from her own private art collection. Ginger Levit was named an Influential Woman of Virginia by Virginia Lawyers Weekly in 2009 because of her advocacy for the arts. A well-known French and American art dealer, art consultant, and writer, Levit has curated numerous exhibitions at art galleries and for corporate collections on the East Coast. Introducing - The John - Richard Boutique It encompasses a wide variety of styles of accessories, botanicals, art work, occasional furniture pieces, lighting etc. Charles Faudree’s nearly four decades as an interior designer have allowed him to work throughout the United States and Europe. His designs have appeared in numerous publications including Veranda, House Beautiful, Southern Living, Southern Accents, Traditional Home, Renovations Style, House and Garden and Country Living. IFDA_1\2h_0910.indd 1 LOCALLY GROWN FLOWERS. light and dark, circles and squares. Some of the pairings, however, are not as familiar. pattern on the floor and a faux-finished bronze ceiling, the room rises from dark to light. Owner of DESIGN SOLUTIONS, Alyson Stinson, a 1984 graduate of VCU’s School of the Arts, has redesigned and staged homes for sale since 1998. Carmela Wengraitis is president of Kitchens ETC, an interior design firm specializing in the design, supply and installation of cabinets and countertops for every room of the home. A 20-year design veteran,Wengraitis has designed projects along the East Coast and the Caribbean. Kate Oliver believes that good design is not a compromise between high-end or low, of custom versus off-the-shelf. Each project is a unique opportunity to use available resources to create rooms that reflect each client individually. Her projects have ranged from small, one-room designs to homes in excess of 8,000 square feet. This year, she helped Lumber Liquidators stage and shoot over 45 interiors for its catalog and website. Native Richmonder David Allan Ballas graduated with a bachelor’s degree in interior design from Virginia Commonwealth University in 1985. After graduation, Ballas worked in the design studio of Richmond’s fabled Miller & Rhoads, spent several years in commercial design with Robert Ledford Associates, with Central Fidelity Bank’s design department and with Robert Rentz Interiors. Ballas has operated as an independent interior designer since 1992. 1) Brunschwig & Fils fabric in Durbar Strie 2) Melanie Palma Design wall treatment 3) Antique Delft bowl from Melanie Palma Designs 4) In bowl: Robert Allen fabric in Eilersten-Spa, Greenhouse fabric in Spa Blue and Mineral, Schumacher fabric in Kipling Chenille 5) Thibaut fabric in Petersburg 6) Former Stuckey’s Antique Emporium French urn lamp from the private collection of David Allan Ballas Interior Design 7) Robert Allen tassel 8) Painting by Elizabeth H. Slipek 9) Velvet throw in cream, black and caramel 10) David Allan Ballas Interior Design custom pillow 11) West End Antiques Mall bed 12) David Allan Ballas Interior Design hand-painted and -upholstered Louis XVI bench 13) Antique English sterling candlestick from the private collection of David Allan Ballas Interior Design SPECIAL THANKS Oriental rug, W. Hirsch Oriental Rugs; hand-painted faux wall in master bedroom, Melanie Palma Designs; custom stripe painting in hall leading to bedroom, all wood trim and ceilings in both areas, Barden’s Decorating, Inc.; antique furniture, West End Antiques Mall and collection of Mr. and Mrs. George Anderson; furniture, lighting, accessories and art, Private Collection of David Allan Ballas Interior Design; fabric, Robert Allen Thibaut, Greenhouse Design; custom window treatments, custom bedding and pillows, LHS Designs LLC; paint, Virginia Paint Company and Benjamin Moore Paints; custom framing, Frame Nation; electrical work, InnoTricity; custom glass transom, Stained Glass Creations; coverlet, shams and sheets, Yves Delorme; pen-andink drawing; Donna Mudd, Daydream Interior Specialties. Special thanks to Samuel J. Ballas Jr.
getting ready for special events. This romantic, feminine room is meant to evoke those occasions. inside the window frame showcase an Indianinspired design. “I wanted this space to be soothing and calming, a sanctuary for a woman, but not over-thetop and really frilly,” Chappell says. SPECIAL THANKS Paint, Virginia Paint Company and Benjamin Moore Paints; marble countertop and tile, Charles Luck Stone Center; fabrics, Designers Market; lighting, Julie Neill Studio; hardware and commode, Linda Gettings, Noland Co.; mirror, Mary Hannon Packard; painting, R&L Painting & Carpentry Inc.; tile installation, Scott Bourne of W.S. Bourne Tile & Marble Inc.; window treatments, Seng Ngeam; electrician, Terry Guthrie; photographer, Todd Wright; fixtures, Thomas Layton of Moen. Special thanks to Drew Johnson and the Chappell family. Brooke Chappell is an interior designer and decorative painter who has worked on three Richmond Symphony Orchestra League Designer Houses and on a Richmond home for a Historic Garden Week tour, and she was art director for the Richmond Jazz Society’s gala events. She is a board member for the Virginia chapter of the American Society of Interior Designers. Chappell is a consultant for Charles Luck Studio in Manakin. We Wash Rugs The Old Fashioned Way. built by Westfall serves as a cozy window seat in the 16-by-16-foot space. Julilly Westfall of Westfall Interiors demonstrated a flair for design at a very early age. As a young girl — and much to the consternation of her mother — Westfall constantly rearranged the family’s furniture.Years later, with extensive experience in retail-furniture and rug sales,Westfall now specializes in helping her clients select quality pieces, in addition to working with the treasures they already own. Elizabeth Cabell of Cabell Design Studio is a professional member of ASID and a Certified Interior Designer. She has passed the National Council for Interior Design qualification and has 18 years of experience in the interior-design field. Cabell Design Studio, an award-winning residential and small-commercial design firm, has completed projects across Virginia; in Savannah, Ga.; Hilton Head, S.C.; and Charlotte, N.C.
“The 20-foot-long hallway,” Leo says, “branches off into other spaces, so we [made] the hall bright — not contemporary, but not traditional, either.” Leo worked with faux-finish artist Kim Rosser on this space, and the pair has used glazes, metallics, textures and other finishes. Born in Berlin, Germany, Juliana Leo got her start in decorative faux finishing in Houston, Texas. She attended several training and design schools, and in August 2007, she moved to Richmond to start her own business. Over the past three years, she has decorated a variety of homes and commercial spaces. Move Move up…without up…without moving moving at at all. all. Today, it just makes sense. And the design/build experts at DesignLine can Today, it just makes sense. And the design/build experts at DesignLine can make it happen…beautifully. From whole house renovations…to kitchen make it happen…beautifully. From whole house renovations…to kitchen and bath remodels…to additions and barrier-free conversions…DesignLine and bath remodels…to additions and barrier-free conversions…DesignLine can transform your home to impact the life you live. So make the move— can transform your home to impact the life you live. So make the move— and stay home. Call DesignLine. And love your house again. and stay home. Call DesignLine. And love your house again. For a complimentary consultation, contact Wayne Booze, 804-270-4411. For a complimentary consultation, contact Wayne Booze, 804-270-4411. © 2009 DesignLine, Inc. © 2009 DesignLine, Inc.
1940s; there is a modern crib. Anthony Turner is an entrepreneur who founded HomeCraft Marketplace, an artists’ co-op on Lakeside Avenue in Richmond. Turner handpaints most of the furniture in his shop, Feathernesters, and creates many of its one-of-a-kind decorative items. Turner and his business partner, Marc Goswick, were featured on a September 2005 episode of Al Roker’s Roker on the Road (a program on the Food Network). We are not a showroom. We are not a store. We are a warehouse with thousands of flooring options, up to 70% off retail everyday. Woven Wools, Seagrass, Sisals, and Unique Patterns on a roll or bound and ready to go. Hundreds of sizes. It’s like a flooring safari! Mention this ad to receive an additional 50% off already discounted prices. attention to detail results in a fine-tuned portfolio We understand that. but it’s not necessarily a masculine space. Known for using industrial elements in the domestic environment, Ellen Norris of Caryatid Interiors sees beauty in ordinary objects. She has been featured in various Richmond Times-Dispatch articles over the years, and this year was also featured in Remodel magazine. She started Caryatid Interiors in 2006, has worked with clients from New York to Florida, and is a member of the International Furnishings and Design Association. to 1970s,” Norris says. “But there are some contemporary pieces, too.” A vintage Italian Osvaldo Borsani for Tecno lounge chair is an iconic design of the midcentury modern era. Although the La Différence desk is contemporary, it is a reproduction of a piece from the period. The ceiling is a Henri Matisse-style mural, and the room is accented with Italian retro ceramics, pottery and glass. room on the third floor of the house. once served as servants’ quarters. Anderson in the Kelly Room. Kat and Mike Liebschwager own Ruth & Ollie, a home-furnishings store in Carytown. In order to open their store, they left the corporate world and branched out into interior design and retail. Mike (Ruth’s grandson) is the day-to-day face of Ruth & Ollie, and Kat (Ollie’s great-granddaughter) runs the interior-design business and has had four of her design projects published in Better Homes & Gardens Special Interest Publications. with tradition that also suits the present day. Drysdale arranged the principal furniture grouping around the fireplace. Her design features two opposing sofas with two sets of chairs facing them. The room also includes a secretary designed by Drysdale and a custom-stencilled floor. Some pieces are antiques, but contemporary art provides contrast. “There is not a lot of natural light,” Drysdale says, “so I’ve made the room very light with upholstered furnishings in white, off-white and creamy tones, while the floors are cognac with an orangey tone. I picked up the color of the floor with accent pieces.” Mary Douglas Drysdale has won numerous awards, including “Innovation in the Traditional Style” from Traditional Home Magazine. House Beautiful named her as one of its top designers in America for five years running. In 2001, she was selected by Architecture and Interiors magazines as one of the top practicing designers in the country. Weaving eco-friendly principles into design so that clients benefit from a healthier environment is Randy Trainor’s focus. The owner of CRT Interiors, Trainor specializes in designing eco-friendly clubhouses. Trainor is a Dream Room awardwinner and has helped clients from Florida to Maine for more than 20 years. Her work has been published in Accent Home & Garden; Decorating Solutions;Window Fashions; and Walls,Windows and Floors, as well as Carol Donayre Bugg’s books Smart & Simple Decorating and Creating Great Guest Rooms. She writes the “Designing Wisely” column for New Hampshire Seacoast newspapers. into the room to complement the solid-acrylic desk she added to the space. An end table Trainor will one day inherit also finds a place here. You’ve seen the art, now come see the gallery! he homeowner’s gun collection in the study inspired the design of David Barden’s Virginia gentleman’s room. ing with a box-pleated valance and Robert Allen Ikat-print linen drapery panels.” Loaded bookshelves line most of the walls, and a cigar humidor is prominently displayed. “This is a room for smokin’ and drinkin’,” Barden says. David Barden received a degree in interior design from the Art Institute of Pittsburgh more than 20 years ago. He relocated to New York, where his talent garnered positions with Scalamandre, Lee Jofa, ABC Carpet & Home, and Gracious Home. After 10 years in New York, Barden opened David Barden on Libbie Avenue in 2005. He closed that storefront in 2009 and opened in his own building on Morrison Road. Hardy of Accent Draperys & Interiors designed Café Rothesay to be a welcoming and relaxing space for visitors to rest and grab a boxed lunch or refreshments following the house tour. Karen Hardy and her husband, Ramon, own the 24,000-square-foot workroom and design firm Accent Draperys & Interiors. She is an interior designer and a Window Fashions Certified Professional. Their projects have been featured in R.Home, Remodel Magazine,Window & Wall Ideas, Homes of Color and Window Fashion Vision. Recent projects have included the Jefferson Hotel and Westminster Canterbury. 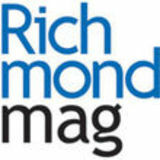 Subscribe today and receive six issues of R•Home and 12 issues of Richmond magazine for only $14. Visit rhomemag.com or call 804-355-0111. Becky White received a bachelor’s degree in biology from Virginia Tech and VCU. She has a landscape-design certificate from George Washington University.White gained work experience as a horticulturist at the University of Richmond and at Richmond Country Club. She was hired in 2007 as a horticulturist and was promoted to groundsdepartment manager at the Country Club of Virginia later that year. Sarah K.P. Davenport has worked with Robbins Landscaping for the past year as a horticulturist, designer and salesperson. She is a graduate of Virginia Tech’s history and horticulture departments and is a Certified Virginia Horticulturist. Davenport is working on her Landscape Design Professional certificate at the University of Richmond. with holly hedges and light-colored gravel chips complement the existing boxwoods, which were specified by Gillette to be naturally growing. This pairing unifies the Western and Eastern influences. by John Sars. A pea-gravel walkway leads past a planter surrounded by shade annuals to a comfortable bench beneath a mature Japanese maple. became a big part of her life. In 2007, she completed the University of Richmond’s landscape-design program and started her own company. Monks credits much of her success to John Sars, owner of Class A Grounds Management LLC, established in 1991 in Prince George County. The company artfully installed Monks’ designs and brought them to life. lure an array of native butterflies. Beth Burrell, owner of Giving Tree, is a plant specialist and garden designer, focusing on the fourseason garden — using rare and unusual plants combined with striking foliage combinations, which offer year-round interest to any garden setting. With over 25 years of expertise, Burrell provides a variety of services, including landscape design, specialized maintenance consultation, garden coaching and installation. F. Gillette bench in her space but, paradoxically, not to make it so inviting that someone would want to sit on it. Certified Horticulturist and Certified Landscape Designer. She received her postgraduate education in landscape design from George Washington University and the University of Richmond. Willis has served on the board of directors for the Virginia Society of Landscape Designers for the past three years. David Hensel began working with Eve in 2005. Eve Roemhildt decided in 2005 to combine her love of gardening and landscape design. She worked at The Great Big Greenhouse for three years before starting her own company, Edengate Design LLC. She completed the University of Richmond’s landscape-design professionalcertificate program in July 2009 and became a Virginia Certified Horticulturist later that year. on Monument Avenue are on display here. events under a full moon,” Turkovich says. Mike Turkovich is the owner of Berkeley Design Group (BDG). He is a Virginia Tech graduate in landscape design and business management. Turkovich has been working in the landscaping field since he was 13 years old. BDG services Richmond, Hampton Roads and the Northern Neck, specializing in hardscaping and low-maintenance landscapes. native Virginia plants contrasts with the garden of white annuals. Charles Gillette design as much as possible. Heather Barber, CLD, GLA, ASLA, is the creator and principal designer of topos LLC land planning & design. Barber’s skills have been recognized by the 2002 Sustainable Sites Award and others. A member of the American Society of Landscape Architects, Barber has a bachelor’s degree from Clemson University, a certificate in landscape design from George Washington University and received her master’s degree in landscape architecture from Virginia Tech. Virginia R. Rockwell,VSLD,VCH, is principal designer and owner of Gentle Gardener Green Design. In addition to her VSLD certificaton, she is certified as a horticulturist by the Virginia Nursery and Landscape Association. Scotty Dilworth recently moved back to Richmond after 18 years on the West Coast. Dilworth and Rockwell co-produced the 2008 Virginia Society of Landscape Design’s Green Tour, showcasing sustainable projects in Charlottesville. toned images of tennis players, bathers and Gillette’s plans” placed on weatherproof banners. gazebo is an ideal resting place along the tour. Bill Fields works as a consultant with Antique Building Products in Amherst,Va., and with ReStore RVA in Shockoe Slip, salvaging and reclaiming wood from old buildings. He also owns Van Jester Woodworks with partner Zack Jester in Scott’s Addition. He has worked with architect Mark Spangler on a number of projects. Spangler designed the 38,000-square-foot Dover Hall in Goochland. antique beams and a reclaimed-copper roof. Paul DiPasquale’s (pauldipasquale.info) proof castings of the children from his Arthur Ashe sculpture on Monument Avenue can be seen in the Children’s Garden. He also created the monumental fiberglass bust, Connecticut, which overlooked Richmond’s baseball stadium, The Diamond. The Smithsonian National Air and Space Museum and the National Aquarium in Baltimore, Md., as well as numerous corporate collections, own and display DiPasquale’s sculptures. Tom Chenoweth (astradesign.com), whose piece, Gnomon, is on display at Rothesay, was a founding member of 1708 Gallery and has exhibited his work extensively in Virginia and beyond. Chenoweth is well-known in the Richmond area for his functional metalwork including furniture, gates, railings and fences. Jillian Holland (myspace. com/sculpturebyjill) has five pieces of sculpture at this year’s Designer House. Several exhibitions of her work are on display from Louisa to Virginia Beach. Holland also worked as a crew member on Neptune in Virginia Beach with Paul DiPasquale. Bradley Robinson (bradleyrobinson.us) shows his piece Paulo and Francesca for this year’s Designer House. Robinson has carried out commissions for several national institutions, including the Washington National Cathedral, Rice University, and Washington and Lee University. He participated in the upcoming documentary Masters of the Building Arts and is preparing for his first solo exhibition in 2011 at Page Bond Gallery. Bill Thomsen (billthomsen@ earthlink.net), a metal sculptor specializing in wildlife-inspired works, made several pieces for the Designer House. Each sculpture is made of steel and is cut, shaped and welded by hand. These one-of-a-kind designs are then signed and dated. Check www.shopgather.com for new weekly specials. MAKE IT A PICTURE PERFECT SUMMER. Check out Canon’s hottest new digital cameras at Richmond Camera today. Canon cameras include a limited, one-year Canon U.S.A. warranty. Richmond Camera is an authorized Canon dealer. MONDAY - FRIDAY 7 a.m. - 6 p.m. SATURDAY 7 a.m. - 3 p.m.
Tire and Auto Service Professionals! this wonderful house and working with our committee to make this such a successful venture. 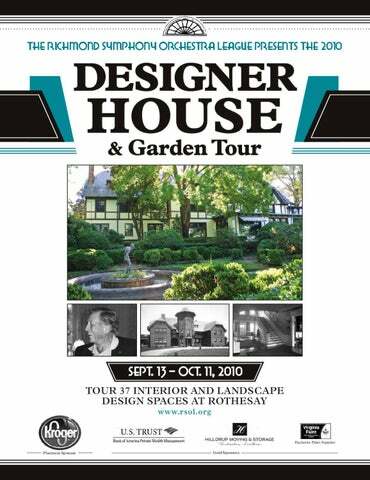 Special Thanks: The League would also like to acknowledge the contributions and support of the editors and staff of Richmond magazine for producing our beautiful publications for the 2010 Symphony Designer House. The partnership with Richmond magazine has helped us take this project to a higher level of excellence. Join Us: The Richmond Symphony Orchestra League, the major support group of the Symphony, invites you to join our organization. For information, contact Membership Vice President Ludi Webber at tenplyr50@aol.com. how is worth measured? Is it simply total assets minus total liabilities? At U.S. Trust, we believe affluence should be measured not only by net worth, but by the things in life that take on a worth all their own. And we apply our intellectual resources and financial acumen toward helping clients realize that worth. Because we believe you deserve more than wealth management — you deserve worth management. richmond — Norfolk — Charlottesville — roanoke | 1.800.542.8622 | ustrust.com Investment products: Are Not FDIC Insured, Are Not Bank Guaranteed and May Lose Value. U.S. Trust, Bank of America Private Wealth Management operates through Bank of America, N.A. and other subsidiaries of Bank of America Corporation. Bank of America, N.A., Member FDIC. WhAT IS WorTh and the U.S. Trust logo are trademarks of Bank of America Corporation. © 2010 Bank of America Corporation. All rights reserved.